After a dream starts to his career in NFL with New York Giants, Odel Beckham Jr had a ghastly break. He suffered a gruesome ankle injury during Giants week 5 matchup against Los Angeles Chargers. Giants are one of the teams whose season was derailed due to injuries especially at the Wide receiver position and OBJ's injury was a significant one, which led the team to have one of the franchise's worst seasons ending up with a number 2 overall pick in 2018 draft. 2017 was supposed to be the year for OBJ to finally sign the most lucrative Non-Quarterback deal ever and then the injury happened. Giants will now be in limbo to sign OBJ to a long-term deal until they can see he is back to his old self. After suffering an injury as he did last season it is going to be very difficult to come back from it. If there is anyone who can come back it is OBJ. Beckham's rehab is on right track and expected to start week 1 and may even participate in mini-camp. 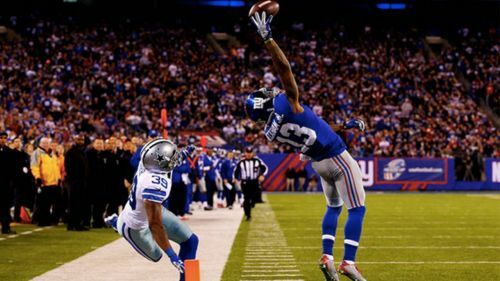 Beckham who still expects to sign a lucrative long-term deal while the market for wide receivers is better than ever. With players like Sammy Watkins and Danny Amendola getting some surprisingly lucrative deals this offseason OBJ would be still expecting the lucrative deal he was looking for before the start of the season. Giants probably do not want to commit until they can see what he can do on the field. A Showtime drama between Giants and OBJ could very well be a possibility before the start of the season, but it is highly unlikely that a contract could be reached. If Beckham continues his rehab and comes back to start week 1 Eli Manning would be one of the happiest QBs in the league as he would get his best pass catcher in the league without much of the drama that this giants team and its fan base could use.